You may not have covered them in detail, or at all, in grad school. 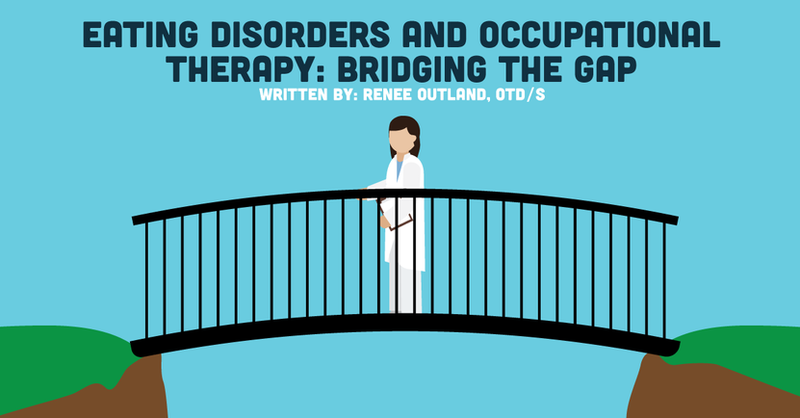 Occupational therapy and eating disorders aren't commonly considered together, yet there is a need in the field of eating disorder treatment that as OTs, we are practically designed to meet! While there are a large number of existing treatment programs that are highly effective, there are also systemic barriers preventing many people with eating disorders from accessing care that could greatly improve their health and quality of life. As OTs, we have the opportunity to contribute an additional rung to the ladder of treatment options by offering holistic, experiential services on an outpatient basis for those who would otherwise be unable to access such care. In this article, I’ll be covering some common (and sometimes incorrect) assumptions about eating disorders, the importance of experiential interventions in eating disorder treatment, and the role that we (OTs) can play in making these interventions more accessible. What’s the deal with eating disorders? From feature-length films like the Netflix original To The Bone, to social media campaigns touting the harm of fashion model bodies, to DSM symptom lists in classroom PowerPoint slides, there is a lot of information available about eating disorders. Some of it is true and helpful, some of it is partly true and partly helpful, and some of it is unfortunately untrue and unhelpful. Let’s sort through a few important pieces of the information—and misinformation—that are out there. Addictive: They function much like other addictions, except instead of drugs or alcohol the addiction is to behaviors such as starving, exercising, “clean” eating, purging, etc. They are not lifestyle choices or harmless phases. Maladaptive coping mechanisms: The above “behaviors” are not random. They often serve a very specific purpose that the person with the disorder may or may not be aware of (e.g. starving in order to numb out intolerable emotional pain from a traumatic event). The behavioral symptoms are an indication that there is a deeper problem. Caused by the media: Images of airbrushed, underweight models can certainly be triggering and foster low self-esteem in someone with an eating disorder. However, the media is not the root cause. Eating disorders develop from a complex mix of factors that varies from case-to-case, and unfortunately cannot be eradicated by body-positive campaigns alone. Personality flaws: Negative traits such as irritability or resistance to treatment have been described in textbooks as characteristics of the type of people who develop eating disorders. However, these traits are reflective of the disorder, not the person. If you look past the surface, it is understandable, for example, that a person would be generally irritable if they had a voice in their head like the one described above by the anonymous client. Glamorous: So often, a person with an eating disorder is portrayed as a thin, beautiful woman who eats tiny bites of food and drinks green smoothies. As she appears to effortlessly lose weight, she is showered with attention by friends and family and strangers who notice how her clothes hang off of her; they are concerned, but also jealous of her waif-like frame. This does not reflect reality for most**. Life with an eating disorder is often painful, lonely, and fully unglamorous (think constipation, bloating, poor concentration, teeth stained by stomach acid, hair loss, bad breath, etc.). Only experienced by young, underweight, white, middle/upper-class women: There is no statistic to suggest this to be true, and plenty of evidence to the contrary. Out of every three people with an eating disorder one is male, eating disorders are equally prevalent in the range of classes and races, there is no age limit on who can develop an eating disorder, and many people with serious eating disorders are not underweight (NEDA). What do occupational therapy and eating disorders have to do with each other? A holistic approach: Eating disorders impact virtually every occupation and client factor, from rest/sleep to basic ADLs to social participation, from cognition to values to body functions, and almost everything in between. OTs’ specialty in analyzing complex, multi-faceted cases to identify and address relationships between factors in all areas of the client’s life (including their environment!) is of particular value. A broad, integrative lens is essential for the effective evaluation and treatment of eating disorders. Clients must learn to tolerate distress and use new coping skills during activities such as cooking and clothes shopping. The opportunity to have controlled, therapeutic experiences with these activities is key to their success, and functional assessment during these interventions can yield critical information about the client and their needs. The use of downgraded, non-threatening activities can also be used as practice arenas for clients to build the skills required for more challenging tasks (for example: practicing mindfulness while making a beaded necklace, with the goal of being mindful while eating a meal). Many people with eating disorders have difficulty expressing their thoughts and feelings in standard conversation. The use of alternate mediums such as creative writing or drawing, or talking while engaging in an activity, can facilitate increased access to and expression of the client’s inner life. In addition to experiencing traumatic components of the eating disorder itself, the majority of people with eating disorders experienced trauma prior to the onset of the disorder. A growing body of research suggests that reconnecting to one’s physical self is crucial for recovery (Van der Kolk). This re-connection is done through the use of guided movement and sensory strategies, and thus far has been primarily explored through the use of yoga (some recent articles can be found here). Identifying the self: Eating disorders can be especially difficult to treat, because as the disorder progresses it often melds with and overshadows the client’s sense of self. This makes it difficult not only for the therapist, but for the client themselves to identify even basic personal truths. I know of someone who spent years saying and believing that they didn’t like potatoes, when in reality that was just a restriction imposed by the eating disorder. This blurring of the self and the disorder can occur globally or around specific topics like exercise, food preferences, leisure interests, and much more. Untangling the disorder from the client’s true self is central to the recovery process. An OT’s specialty in incorporating volition, motivation, values, roles, and performance patterns in both our evaluation and intervention process can be especially beneficial for these clients. So far, only a handful of treatment programs in the U.S. have recognized the potential in this match, and one excellent example is the Eating Disorder Center of Sheppard Pratt Hospital in Maryland. They are widely recognized for their high-quality care, and I have seen first-hand how their OT department serves as a cornerstone of the program. Check out their website for more information about their treatment approach! We know that eating disorders are prevalent and can have devastating consequences, and we know that OTs are uniquely suited to treat them. We also know that there is already a functioning treatment system in place. If that is the case, is it really that important for OTs to put in the work to advocate for a spot on the team? Well, yes. To be clear, treatment programs that provide the current standard of care are doing amazing work by helping their clients find health and healing. OTs can make valuable contributions to these existing programs, but that’s just part of the picture. The problem is that treatment is only effective if people can access it. Options for treatment can be difficult to access if a) there are barriers to reaching them, or b) they don’t exist in the first place. You might be thinking, “but you just said that there IS a functioning treatment system” and you are correct, but bear with me for a moment. Location/transportation: If you don’t live near a city it can be difficult to find high-quality treatment providers (or any provider at all). Financial cost: Even with high-quality insurance, the cost of treatment can be a heavy burden. This is especially true for those who require intensive outpatient treatment, partial hospitalization, and/or residential treatment. These programs can cost thousands of dollars after the portion covered by insurance, prompting the formation of groups like Project HEAL that raise funds to support eating disorder treatment. Time: In addition to the cost of care itself, an individual seeking treatment must be able to afford to take time out of their daily life. Depending on the severity of the case, treatment could require anywhere from 1-2 hours per week to full-time residential care. This can be exceptionally difficult to manage along with work, family, and/or school obligations. Clinical requirements: In order to be admitted, most treatment programs set very specific parameters around factors such as weight, treatment history, food allergies, other medical conditions, gender (many residential programs do not admit males), severity of symptoms, and more. Waiting lists: During busy seasons, an individual may have to wait a month or more to receive urgently needed care. Residential/Inpatient: Clients receive 24/7 multidisciplinary care. Residential programs typically offer extensive experiential components such as therapeutic meal preparation, art therapy, therapeutic clothes shopping, etc. while inpatient programs are focused on medical stabilization. Partial Hospitalization (PHP): These programs also provide multidisciplinary care, and are generally 6-8 hours per day, 5-7 days per week. Like residential programs they often offer experiential interventions, but typically provide more group-based and less individual treatment. Intensive Outpatient (IOP): These programs are structured much like PHP programs, with a lower treatment dose of 3-4 hours per day, 3-4 days per week and a greater emphasis on group-based therapy. Outpatient: While some group-based treatment is available, most outpatient care for clients with eating disorders is delivered on an individual basis by psychologists, nutritionists/dieticians, and/or primary care providers. Whether group-based or individual, this typically involves some form of talk-therapy, nutritional counseling, and medical monitoring as needed. On a weekly basis, this often results in 1-2 hours of care. If you scan through this outline, it may seem unremarkable. Even comparing an IOP program of only 3 hours per day 3 days per week to outpatient care, you are still going from 9 hours per week of multidisciplinary care with experiential components, to 1-2 hours per week of care from individual providers who often do not deliver experiential interventions. Granted, I am speaking in generalities here; there are certainly exceptions. For example, if you are lucky enough to find a provider like Marci Evans, a Boston-based dietician who takes a holistic approach to her practice, you may be able to access experiential interventions such as therapeutic meals on a standard, outpatient basis. But, for many (if not most) people, in order to access the benefits of experiential interventions you must be admitted to at least an IOP program if not a higher level of care. Transitioning between levels of care is already difficult, and such a large structural gap increases the struggles and risk of relapse that many clients face when adjusting to less clinical support. Talk therapy is important, but as discussed above, experiential interventions also play a significant role in the recovery process. The “more recovered” a person gets (often an objective measure of weight and “behavior use” rather than a subjective measure of the client’s experience), the more difficult it is for them to access the experiential interventions that could have a significant impact on their recovery. This issue is further compounded by the fact that some clients in residential treatment—where there is the greatest access to experiential interventions—may not yet be able to tolerate the psychological distress of something like therapeutic clothes shopping with a body image therapist, or 1 on 1 therapeutic meal prep with a dietician. As the client recovers and moves to a lower level of care, those experiential opportunities are often lost. Example scenario: a client in outpatient care relapses and would benefit from therapeutic meal planning, but does not need the full menu of IOP programming. This client would most likely be forced to a) pay for services that they don’t really need in order to access the ones they do, or b) forgo the added support. Option “b” means they would either muscle their way through the relapse, or continue to decline to the point of actually needing the full range of IOP services. Whether a client is moving up or down the treatment ladder, the gap is a problem. We have a profession that, at its core, is aligned with the needs of people with eating disorders, and a small percentage of OTs are already working in eating disorder programs. If we could offer accessible, experiential (i.e. occupation-based) OT services on an outpatient basis without requiring enrollment in a full program, we could help to combat some of the systemic barriers that prevent people from accessing care that could support their recovery process and improve their quality of life. I’m interested . . . but now what? “Now what?” is a great question, and I have some thoughts, but no easy answers or quick fixes. I think that moving forward, collaboration will be key in making any kind of meaningful change. Finding connections both within our profession and with other professionals who are currently working in the eating disorder field is essential. Even after extensive searching, I could not find any OTs in the U.S. who offer the range of experiential interventions described above on an accessible, outpatient basis (if you practice “in the gap,” please let us know!). While my search was not successful in that regard, I did find incredible support in the eating disorder community for any future efforts of OTs who want to explore this new area of practice. I have corresponded with eating disorder clients from across the country who have been in most/all levels of care, OT staff who work in the existing levels of care, directors of eating disorder programs, and a prominent psychologist in the field of eating disorder treatment, and they all, without exception, endorsed the importance of making experiential interventions more accessible. I don’t have the roadmap to making this a reality—it could involve policy change and program development in existing treatment organizations, increased education in mental health and eating disorders in OT degree programs, the launching of private practices, and/or something completely new and different—but I firmly believe that it is worth exploring. Part II of this article will give both an in-depth look into the daily life of people with eating disorders, and practical guidelines for those who want to develop a better clinical understanding of this population. ANAD. (n.d.) Retrieved November 17, 2017 from www.anad.org/get-information/about-eating-disorders/eating-disorders-statistics/. NEDA. (n.d.) Retrieved March 16, 2016 from www.nationaleatingdisorders.org/diversity. How Do You Know if Travel PT Is Right For You?